This farm catching the late afternoon light is off Bradley Creek Road Between Milton and Lascassas Tennessee. Oil on canvas, 10x20. The painting finally dried enough to put on the scanner. 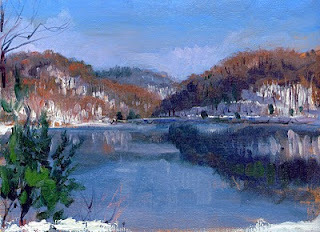 This is from the 1/31/10 freeze out with the other Nashville Painters at Radnor Lake. 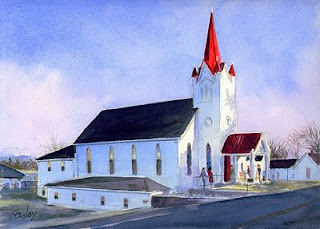 This is a watercolor of the Nolensville First United Methodist Church in Nolensville TN.